Since first meeting them at the UGO launch press conference back in January, it’s been a pleasure to develop a really good relationship with the key people at both the Haldane Retail Group and at Charles Hollywood, the Darlington-based agency responsible for the chain’s graphic design and instore promo work. In the last couple of weeks, the first of the 20 conversions of Netto stores to UGO have taken place, following on from the trial stores – both former Haldanes-branded shops – at Biddulph and Broxburn. In due course, I hope to be able to visit (officially) one or more of the local UGO stores and to get some interior pics for the blog. However, with the first two North East branches – at Eston, near Middlesbrough, and Hartlepool – having already opened, I was curious to check them out as soon as possible. 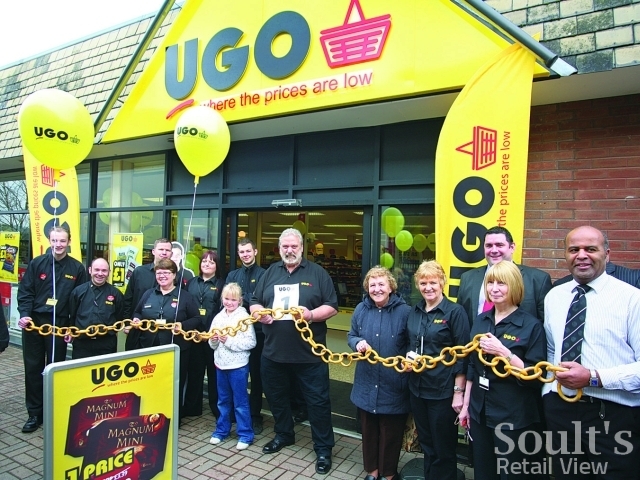 So, how did the two Teesside UGO stores fare? My first stop was the Eston store, which serves the town’s Whale Hill housing estate and is part of a modern retail block that also includes a Numark pharmacy and a Post Office branch. Though there is some parking close to the store, most people I saw seemed to be travelling to and from the store on foot. 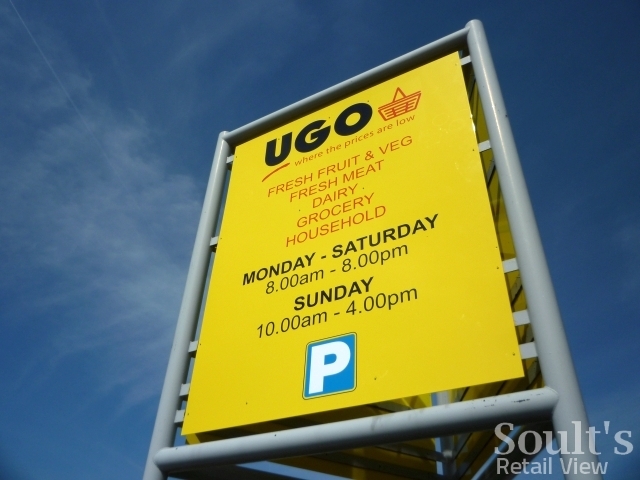 Initial impressions were good – bold UGO banners and signage ensure that the shop is hard to miss, even from the top of the road, and the overall treatment of the store exterior makes a smart and vibrant first impression. I was a little surprised, however, to see shoppers leaving the store with plain white carrier bags. Given the obvious investment in building the UGO brand, it seems a missed opportunity to not use UGO-branded bags. Just by walking down the street, those shoppers on foot could be doing their bit to raise awareness of the local UGO store. My first challenge at Eston was finding the way in. A lack of signage meant that it wasn’t obvious which of the two doors was the entrance, so I tentatively tried one in the hope that it was the right choice (it was). Inside, the store is relatively compact – which is fine – though the interior did feel quite gloomy and cluttered, partly as a result of having rather fewer windows than if it were a detached, standalone store. This is a constraint of the property that obviously has to be worked with, but there are almost certainly ways – through lighting and surface treatment – to brighten things up a bit. Hartlepool’s UGO, in contrast, feels rather more typical of a discount supermarket. Located in the Dyke House area close to the town’s main hospital, the store is housed in a functional but modern standalone building with its own car park, and is probably about twice the size of the Eston store. Though there is some housing nearby, my perception was that shoppers would be more likely to travel to this store by car than on foot. Again, the initial impression is really good, with bold signage and banners ensuring that the store makes its presence felt strongly. After the relative disappointment of the Eston shop’s interior, I was also pleased to find that the Hartlepool store felt much brighter and more spacious, coming across very much like a typical Aldi, Lidl or, indeed, a Netto. I’m sure it’s no coincidence that Haldanes used the Hartlepool store in its initial mockup artwork, as it, rather than Eston, was much closer to my expectations of what a UGO store is supposed to look and feel like. It was almost noon when I visited Eston and gone 4 when I arrived at Hartlepool, but both stores seemed to be doing a steady – rather than a bustling – trade. Despite this, I was oddly struck by the silence in the Eston store, and – despite not usually being an advocate of instore muzak – felt that it could really use some background music to help lift the mood. Happily, the excellent implementation of the UGO brand – which is highly professional, yet warm and fun – carries through to the store interiors. Again, I felt it was more effective in the Hartlepool store, where the greater brightness and sense of space allows the posters and navigational signage to work really well and be better appreciated. On the downside, both stores featured some rather scrappy handwritten signage to indicate where items had been marked down in price, and I thought this looked a little incongruous and unprofessional amid the otherwise slick implementation of the brand. Also, I was puzzled by the prominent use of the abbreviation ‘PMP’ on some of the instore offers posters. As a supposed retail expert, perhaps I should have known already that this stands for ‘price-marked pack’ – basically, a branded product where the offer price is highlighted and preprinted on the item’s packaging. To me it seems a little odd, however, to use retail jargon on customer-facing material. At its press launch, Haldanes made great play of UGO being “the icing on the Netto cake”, and talked of the UGO brand and product mix being designed to provide “reassurance” and a “seamless transfer” for Netto’s loyal customers. 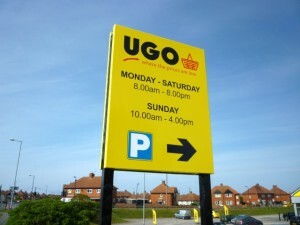 One key Netto feature – the non-food offers – have, sure enough, been carried through to UGO, and the eclectic mix of suitcases, microfibre cloths and Gino D’Acampo cookware seemed to be attracting plenty of attention in both Eston and Hartlepool. On the grocery side, Netto’s own-brand products have obviously had to go, replaced by items from Nisa’s Heritage label. As a very infrequent Netto shopper it’s hard for me to judge the impact of this change, but there are bound to be people who will dislike the disappearance of items that they’ve got used to buying. On the plus side, Netto stores have always included a higher proportion of well-known brands than its hard discounter rivals, Aldi and Lidl, which helps to ease the transition. A key part of the UGO strategy is to make it easier for customers to carry out a full weekly shop, by doubling Netto’s core range of branded traditional grocery lines to around 3,000 SKUs. There was certainly evidence of this instore, with plenty of different items squeezed into the space, and the presence of certain types of product – such as puff pastry (an item I buy often!) – that haven’t traditionally been available from discount supermarkets. Moreover, where items were in stock, there seemed to plenty of them on the shelf. Overall, however, it was clear that there were some problems with availability and stock replenishment. Both stores had some notable gaps, with the fruit and vegetable aisles especially depleted. Hartlepool, for example, had no avocados or cauliflowers, so if you’d gone along with a shopping list you may well have left the store disappointed. 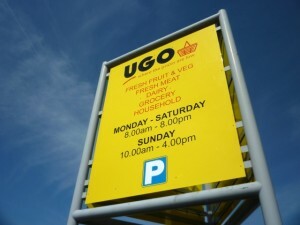 If being able to use UGO “for all your weekly shopping” is one of the chain’s key messages, the other is surely that of value. 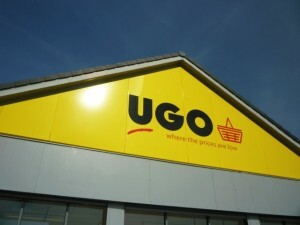 After all, the tagline “where the prices is low” is embedded in the UGO logo and fascia. So, are UGO’s prices low? Again, having not been a regular Netto shopper, it’s difficult for me to be sure how they compare with the store of old. Overall, my impression was that the everyday prices seemed ‘reasonable’, rather than necessarily ‘cheap’. The prices of the fresh fruit and veg that I looked at – such as cucumbers and tomatoes – seemed to compare favourably enough with what I pay in Aldi or Lidl, while the Heritage-branded items from Nisa looked to be similarly priced to the big supermarkets’ standard own-brand items, rather than any of the ‘Value’ or ‘Basics’-type lines. Presumably when groceries are being sourced from Nisa, rather than Haldanes’ own supply chain, there’s a limit to how far the prices can differ from Haldanes’ eponymous stores or, indeed, any other Nisa-supplied outlet. In the alcohol aisle, however, I was pleased to see UGO still offering a decent selection of sub-£4 bottles of wine, at both regular and offer prices – this is one of the areas in which Netto was always particularly useful! As might be expected, the different in size between the two stores is apparent here, with Hartlepool seeming to have a far superior wines and spirits range. Interestingly, where hard discounters (and Asda) have tended to adopt an ‘everyday low prices’ (EDLP) strategy, one of the most notable features of UGO, for me, is its eyecatching offers, which appear to change ever three weeks or so. Prior to my visits, I’d checked out the online PDF of the latest offers leaflet from the UGO website, and was struck by some of the great deals on offer. 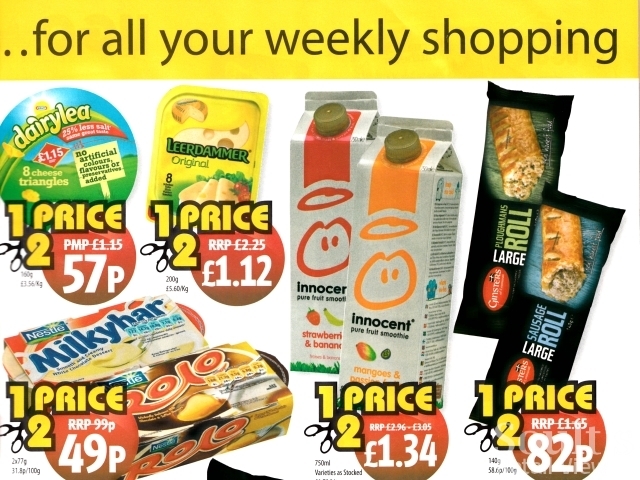 Ones that stood out included two-packs of Frü and Gü puddings for half price (£1.50, compared to RRP of £3.19); 750 ml Innocent smoothies for £1.34 (RRP £2.96 to £3.05); and New Covent Garden soups (£2.19) on buy one get one free. These are genuinely impressive offers; on my way home, I popped into Tesco in Gateshead where I noted that the same Innocent smoothies were being sold at £2.85; today, the same price was being charged in Morrisons in Morpeth. If I lived close enough to a UGO store, these deals would definitely prompt me to make a special trip, and I can imagine other people using UGO in a similar way to ‘top-up’ their regular grocery shop. On the other hand, you might question how far UGO’s target shoppers in areas such as Eston will care about posh soup and smoothies as opposed to keenly priced everyday basics. Given the strength and appeal of the offers, I did feel that much more could be made of them instore. I found it hard to locate the soup, smoothies and puddings offers, even though I’d looked at the leaflet beforehand and was keeping a special eye out for them. The shelf-edge signage promoting the offers was relatively low-key, and in Hartlepool there was actually no reference at all to the soup being on BOGOF. UGO’s special offers seem to be one of its real strengths, and I think more can be done instore to really shout about these deals. Commenting on my blog last week, George Wilson remarked that the staff in the Eston store appeared “not very happy” when he’d recently visited, so I was particularly curious to assess the quality of both stores’ customer service. I was pleased at how smart the staff looked in their new UGO uniforms, but, like George, I was a little underwhelmed by the customer experience. To test the checkouts I bought an item in both stores, armed with a smile and a readiness to engage in conversation. In Eston, the first staff member I approached seemed to be having trouble with her till, resulting in the person in front having to move his purchases to another checkout. She seemed a little flustered as she told me – perhaps rather abruptly – that “there’s no point in you putting your stuff on this till”. I duly moved over to the next till and paid for my purchase, where the member of staff was pleasant rather than friendly. Based on my experience, I probably wouldn’t go back to the Eston store unless it was my local shop. To be a success, UGO needs to keep happy as many as possible of Netto’s customers while simultanously attracting new ones – no mean feat for any business taking over another retailer’s stores. Having tried out the UGO experience, two particularly positive features stand out for me. The first is the implementation of the UGO brand, which is excellent throughout. 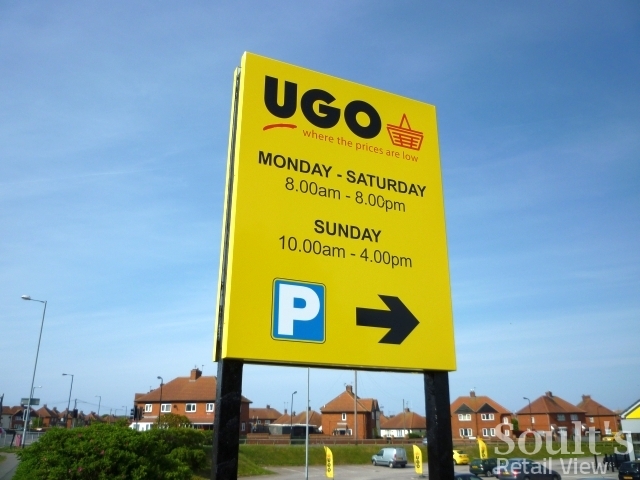 Carrier bags and handwritten signs excepted, UGO has managed to develop a bold, distinctive and highly professional look and feel for the brand, carried through from the welcoming store exterior to the instore signage and offers leaflets. The other real positive is UGO’s special offers. 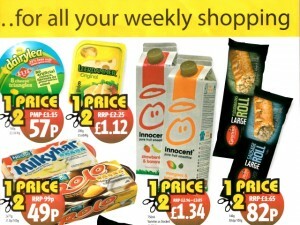 Some of the deals on the products that I regularly buy are among the best I’ve seen in any supermarket, and the chain’s marketing – externally and instore – really needs to celebrate these, perhaps through explicit price comparisons with other retailers, rather than less easily understood references to RRP. As far as negatives are concerned, issues such as brightening up the Eston store interior or making sure the tills work are easily fixable. However, the crucial area for improvement is ensuring that the stores have in stock the products that people are expecting to find. Haldanes, rightly, sees an opportunity to drive footfall and sales at UGO by offering a wider product range than Netto ever did, making it a place “for all your weekly shopping.” As the business finds its feet, delivering on this promise will be key. The danger, otherwise, is that shoppers will get out of the UGO habit as they head off to Morrisons in search of their cauliflowers and avocados. Reminds me of Netto and maybe Lidl? At a time when the retail industry is crying out for innovation, yet another retail company fails. This will undoubtably create more devastation among suppliers, usually those that can least afford the hit from a pre-pack arrangement. They do say that cream rises to the top, time will tell us where the cream was within this short story with an unhappy ending. now left to the mercy of one supermarket in stanley good move by asda but not for cash strapped consumers.have ugo gone bust or been sold? lets hope any future owner has a clue how to run them. Well they didn’t last long, Haldanes all over again. 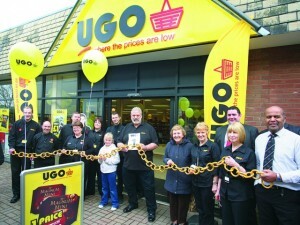 On the UGO Hartlepool launch day, it really was almost identical to Netto. You should go there now. It’s a travesty. Since the Netto store in Hartlepool changed to UGO, I have been disappointed to see that their prices are much higher than Netto’s were. Also, the selection of goods is far smaller than Netto’s. However, I was tempted into the store by the 2 for £15 offer on boxes of beer, lager and cider. These are displayed on the end of an isle with the prices above giving the price for a single unit and the price if you buy the two. unfortunately, they also placed boxes of carling lager on the same display with the single unit price above. I assumed that this was included in the 2 for £15 deal only to find that I paid £18.48 for one box of Carling and one of Strongbow! I returned to the store and spoke to the Manager who very abruptly informed me that he thought it was obvious that the Carling was not in the offer! amittedly, it did give a list of what was included on the (small)notice, but if it was not meant to mislead – why on earth was it on the same display as the ones on offer? I pointed out to the rude manager that the almost empty shop and car park would be even emptier now, as I won’t be shopping there again. and I will warn my friends and family too. I thought one of the ideas of loss leaders was that they were difficult to find in store, so you had to see lots of other items on your travels. And that they brought people in, so promoting them to people who were already instore wouldn’t make sense would it? In fact that would be a waste of product/money. Fair point, but if I was being specially attracted into the store with an eyecatching deal, I would expect that deal to be clearly signposted and correctly labelled. Otherwise I might not bother to make the effort again! Equally, if you’re trying to position your brand as a value retailer, it seems a little perverse to hide away the deals that will help shoppers perceive it that way. I made my first visits to UGO stores while on holiday in the Cleveland area last week. 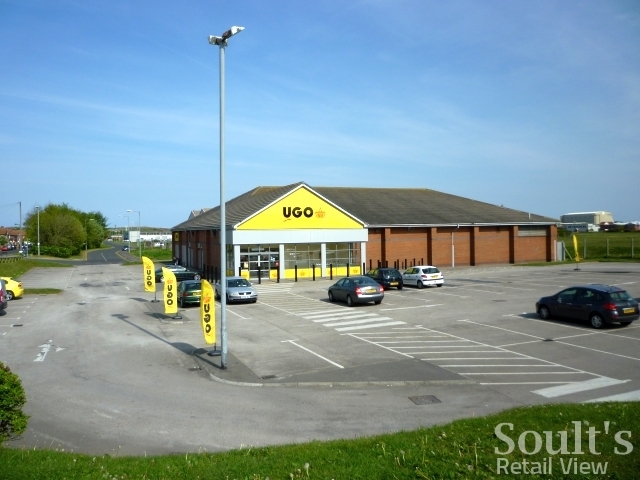 First stop was the store in Eston, which as you stated stood out due to its bright signage, I see what you mean about the entrance – still not clear about in/out but they had now got UGO branded carriers. The store was lacking natural light inside so seemed a bit dull and did have a cluttered feel but not as bad as some of the former Netto stores I’ve been to (Nuneaton in particular,which I’ve still not visited since its transformation to a UGO). It was late Monday morning and the store was doing a steady trade. One of the reasons I went in was to buy some sugar and I saw a pallet full of Tate&Lyle sugar with a printed sign above it proclaiming ’69p(crossed out)each, 10p off now 79p each or 2 for £1.50′!! I took a closer look to make sure I hadn’t mistaken the 6 for a 8 which I hadn’t. At that point a member of staff was heading towards me and I casually pointed it out to her saying ‘that doesn’t make sense’ to which see looked and replied with a laugh; “Huh, you’ll find a lot of things in here don’t make sense, pet” before disappearing into the stock room. I still bought the sugar though and left with a smile on my face. Later in the week I called into the Stanley branch which had a much brighter and tidier feel to it, it was also quite busy and had promotional leaflets at the tills, which Eston didn’t, but that could be down to the time of the week. In conclusion, I left both stores feeling UGO is basically Netto under a different name, with good offers to get customers in the stores. I realise keeping the same colour schemes kept store transformation costs down, which in my mind is not a bad thing as I like the yellow and black signage. 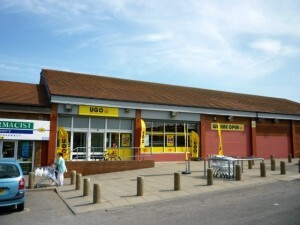 The Ashington Netto store has been rebranded as a UGO store. I went in it this week and apart from the name above the door, you’d just think it was a Netto. They have done nothing to better the store or the product range. The new Morrisons that is taking over the Bedlington Netto store will be a more welcome addition to the shopping scene. Although the customer service aspect will be a cause for concern as that’s a basic regardless of fascia! Great read Graham, really good read. I had a visit to Bradford UGO and will blog later this week about the internals and indeed the supply chain side of the operation from my viewpoint. Being a shopper of many of the stores, the price immediately made me think that this is where the change may need to come quickly as people on the Holme Wood estate in Bradford will not pay 56p for a can of Coca Cola for example, I noted Richard Collins making comments in the Grocer regarding ranging and their review once they are trading which I appreciate, but the range seemed a little lopsided initially with 24ft of Pop which seems remarkably OTT. The supply side agreement with Nisa will limit their pricing muscle and a reliance on ‘specials’ could well see a Safeway style ‘hi-lo’ problem whereby shoppers cherry pick the loss leaders and offers then promptly go elsewhere for their core shop which deprives UGO of driving any profit through higher margin products. Difficult to be too critical of any gaps initially as it will inevitably take time to bed down and integrate everything but I’d be hoping that they are keeping a good track on stock levels instore and tailoring ordering appropriately. Some excellent points there, Steve! Many thanks. You’re absolutely right that there will be an element of bedding down; after all, the stores have only been open a couple of weeks. I just worry that if people don’t have a great first experience they may not bother to go back when the shelves *are* properly stocked. The Nuneaton Netto store closed at noon yesterday (Sat 7th May) and is due to reopen Monday morning as UGO. It’ll be interesting to see what improvements are made. I was never impressed by the Nuneaton store and found it depressing and cluttered/untidy inside compared to the Tamworth store which was bright and inviting. I’ll try and get over in the next couple of weeks and report back on my findings.